Adam Eidinger, chairman of the DC Cannabis Campaign, works on posters encouraging people to vote yes on DC Ballot Initiative 71 to legalize small amounts of marijuana for personal use. Tuesday, the District of Columbia votes on whether possessing 2 ounces of marijuana should be legal when it’s for personal use. Green-thumbed Washingtonians who are over 21 can also grow up to six cannabis plants in their homes if the ballot initiative — Initiative 71 — is passed. That looks like a real possibility. An NBC4/Washington Post/Marist poll in September found that 65 percent of registered voters were in favor. And when the ACLU looked at D.C. specifically, a discrepancy also existed. Using crime and census data from 2010, it found that there were 353 arrests for marijuana possession per 100,000 black residents in Washington — for white residents, that rate was much lower at 128 per 100,000. But is the difference in arrest rates between white and black D.C. residents simply explained by differences in their use of marijuana? More data should be able to answer that. The government’s Substance Abuse and Mental Health Services Administration publishes a national survey, which asks detailed questions about drug use in over 45,000 interviews across the country. Its figures show that nationally, a slightly higher percentage of black Americans than white Americans say they have used marijuana in the past month or year. However, when respondents were asked about lifetime usage, the reverse was true: 51 percent of white respondents said yes, compared to 45 percent of black respondents. 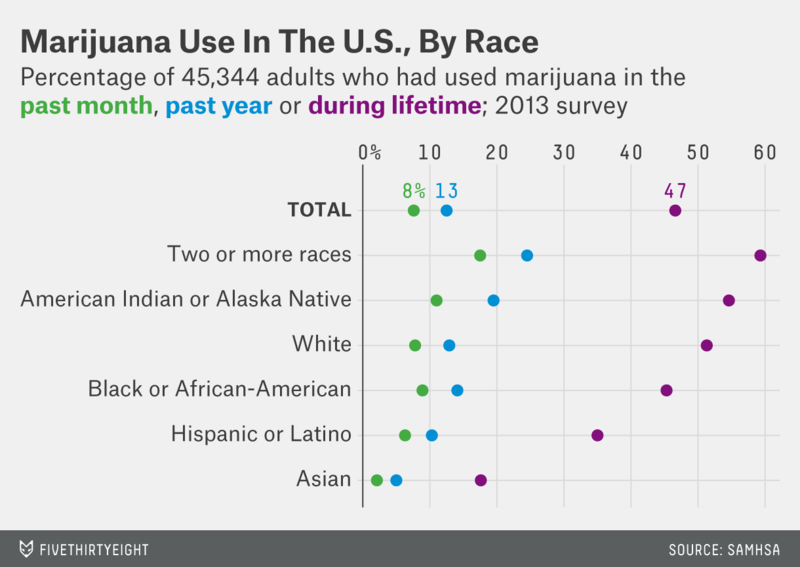 What’s more, neither black nor white respondents were the racial or ethnic group most likely to use marijuana. If those national racial and ethnic trends are the same in Washington (and from what I’ve found, nobody’s published the data to know if they are) then one of the supporters’ reasons for proposing Initiative 71 — that black Americans are being disproportionately targeted — does have some credibility. If Initiative 71 passes, measuring its effect will be difficult. The most recent arrest data from the FBI is from 2012, so it will be quite some time before we can see what effect, if any, it’s had.